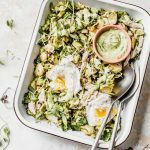 This chicken brussels sprouts salad can easily be made ahead of time and enjoyed for lunch throughout the week. Start by boiling the chicken: place chicken in a large saucepan, fill it with water until the water covers the chicken by 2 inches, then bring it to a boil and boil for 15 minutes or until chicken is cooked. Then, shred the chicken. While the chicken is boiling, cook the brussels sprouts in a skillet with a bit of olive oil. Once chicken and sprouts are cooked, pour them into a bowl and stir to combine. Next, prepare the dressing: place all ingredients in a food processor and pulse until smooth. Pour some of the dressing over the salad and stir to combine. Last, poach (or soft boil) the eggs and add them to the salad. Optional: add a little bit of hot sauce for good measure. *Salad should keep for up to 3 days in an air tight container in the refrigerator.